The revolutionary design of the datAshur PRO includes a rugged extruded aluminium sleeve that is dust and water resistant to IP57 rating and crush resistant, protecting your datAshur PRO from physical damage whilst keeping your data ultra-secure. Built-in to the datAshur PRO is a rechargeable battery allowing the user to enter a 7-15 digit PIN onto the on-board keypad before connecting the drive to a USB port. 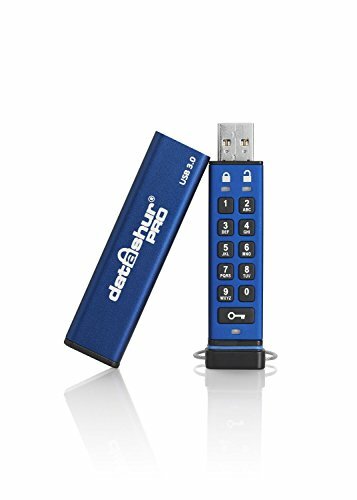 All data transferred to the datAshur PRO is encrypted in real-time with built in military grade AES-XTS 256-bit hardware encryption and is protected from unauthorized access even if your datAshur PRO is lost or stolen. Use it straight out of the box, the datAshur PRO does not require any software or drivers to be installed and is compatible with Windows, Mac, Linux, Chrome, Android, Thin Clients and Embedded Systems. FIPS 140-2 Level 3. Certificate Number 2688. Dust and water resistant durable aluminium housing. Certified to IP57 rating. If you have any questions about this product by iStorage, contact us by completing and submitting the form below. If you are looking for a specif part number, please include it with your message.